'Justinian took a wife: and the manner she was born and bred, and wedded to this man, tore up the Roman Empire by the very roots' Procopius. This book really grew on me the more I read. 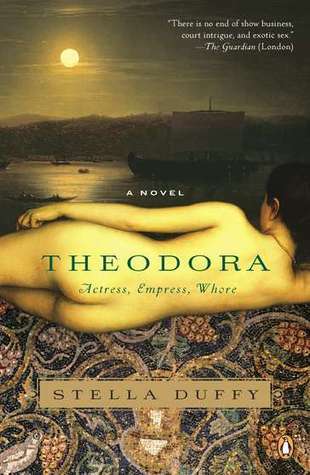 At first I felt a little disconnected from Theodora and was worried that it would make it harder for me to enjoy the novel, but a few chapters later, I found myself drawn in. This is a rags to riches tale, based in historical fact, and the novel certainly comes across as well researched with good attention to period detail. I didn't notice any obvious anachronisms and found myself entranced by the setting. Theodora really grows as a character throughout this piece. I found her a little annoying in the early chapters, but as her story progressed, I found myself warming to her more and more, getting caught up in her journey from actress to empress. She is not perfect and not everything about her is likeable, but I think that makes her more real, more human. The background information in the piece - the divide over Christianity, the life of actresses - comes across well. The reader is given a good sense of what is happening without it feeling too much like a history lesson. The facts are woven seamlessly into the story, giving great support and depth to the plot. I found that Stella Duffy's prose flowed nicely and I enjoyed some of the more descriptive passages. This book should please any lovers of historical fiction, particularly those with an interest in this time period. I received this book as a free e-book ARC from NetGalley. I am hoping to read this one soon, it sounds like some great historical fiction. Thanks for the review. I've read a great deal on this time in history, particularly Justinian, so this sounds like a must read for me. Thanks for the heads up!